Elizabeth Fiedler is honored to announce she has been endorsed by Planned Parenthood. Elizabeth is an active community member and the mother of two young children from a working class family. She is the daughter of two union public school teachers and is a former public radio reporter who covered politics and education. In accepting the endorsement, Elizabeth said, “As a woman who received healthcare services from Planned Parenthood, I know the importance of making quality healthcare available to everyone. We need more women in elected office, holding positions of power, leading our state and our communities. Our life experiences are important and we deserve to be in the room for every political discussion whether it’s about education, taxes or healthcare. Planned Parenthood, women and members of the LGBTQ community are consistently under attack. In their letter of endorsement, Planned Parenthood cited Elizabeth’s commitment to protecting reproductive health and access to family planning services as the reasons for their enthusiastic endorsement. Pennsylvania is 49th in the nation in women holding elected office. 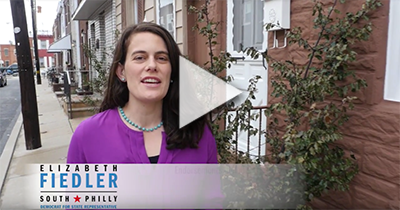 Elizabeth’s campaign is building a broad coalition of support across organized labor, long time community members, progressives and community organizations. The endorsement from Planned Parenthood joins an impressive list of endorsements from the Philadelphia Federation of Teachers, American Federation of Teachers, AFSCME DC33, DC47, 1199C Pennsylvania Association of Staff Nurses and Allied Professionals, Pennsylvania Working Families Party, UNITE HERE!, Teamsters Brotherhood of Maintenance of Way Employees, Representative Brian Sims, Equality Pennsylvania, Reclaim Philadelphia, Emily’s List, the National Organization for Women, Our Revolution, Liberty City Democratic Club, DSA, Food & Water Action, Grassroots Advocacy for South Philadelphia, PennEnvironment and the Pennsylvania Sierra Club. For more information about Elizabeth’s bold stances on education, healthcare, family-sustaining jobs and justice visit our website.